Nest is a smart thermostat. It allows you to control the temperature of your home right from your smartphone. Within about a week, Nest learns your habits and adjusts to your preferred temperatures. Who’s it for? Anyone who wants to save money on their heating and cooling bills. Nest automatically lowers the temperature when you go to bed and shuts off when no one is home. The average user saves 10-12% on their heating bills and 15% on cooling bills. Nest is also great for people who own vacation homes. If you see a big temperature drop coming, but you’re at your full-time residence, you can turn the heat on at your second home so your pipes don’t freeze. Cost? The app is free. The device itself costs about $250, depending on the retailer. If you need professional installation, it costs between $99-250. We seem to run our lives from our smartphones, and now we can run our thermostats that way, too. 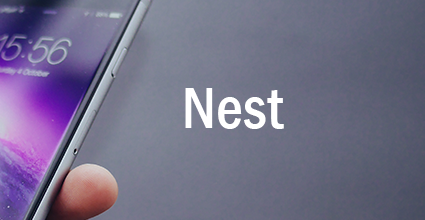 Nest is connected to your Wi-Fi, which allows you to control it from your smartphone. But the best thing about the Nest thermostat is its intuitiveness. You don’t have to use the app to turn the heat on before you get home from work. You can skip have that moment of panic while on vacation when you realize you left your air conditioner running. Nest knows the rhythms of your life and adjusts accordingly. It knows what time you come home from work and knows if nobody’s home so it makes appropriate changes for you. Plus, you can make adjustments using the app if you need to do that. Nest comes with some great additional features. You can look at your energy history to see how much you are using. Daily reports show how much energy you’re saving and give tips on how to use less to save even more on your bill. When you’re choosing temperature settings, you’ll see a leaf symbol when you’ve chosen one that saves energy.